Alyssa here! This year, we’ve got a line-up of some lovely bloggers. Writing tips, humor pieces, the works! This post is by the wonderful Nathan Philbrick. Please give him a warm welcome to the WriteOnCon community! Hello, fellow word-chucks! Seeing as how I’m incredibly organized, clever, and able to cast magic spells on my daily schedule, I’ve been tasked with sharing my advice on how to keep writing when things get busy. For reference, when I say ‘busy’, I’m thinking of the average student/employee whose day is mostly filled with can’t-skip, non-writing activities. If you’re a full-time writer and don’t have time to write… I can’t solve your problems. This is a topic that could be addressed extensively, but I’ve condensed my tips into four main points. You’re welcome. Every night from around nine o’clock until midnight or one o’clock, my brain enters Maximum Creative Output Mode. I don’t know what it is about that time frame (maybe it’s when the house is actually quiet?) but that’s when I write with the most focus and the best results. For other writers, their brain might hit MCOM before breakfast, or in the middle of the afternoon. We’re all wired differently. Recognizing when you produce the best work and setting aside that period for writing only is one way to ensure daily productivity. It’s not always easy (or possible) to work around other demands, especially when your schedule fills up, but prioritize writing during that time whenever you can. Say it’s impossible for me to use the hour I intended to set aside for writing. What then? First of all, I have to remember that nobody dies if I don’t write every. Single. Day. Productivity and discipline are essential, but some days you just can’t make it work, and that’s okay. However, if you REALLY have to meet a deadline, there’s a surprisingly large number of ways to write in the gaps. Keep a notebook or even a folded piece of paper in your pocket, along with a pencil stub, and whip it out whenever you get a chance. Commutes to work or school. Car washes. Boring meetings (don’t tell anyone I said that!). Even in the bathroom (or that!). I’m often surprised how much I’ve managed to jot down at the end of the day by just taking advantage of quick spurts of pencil-scratching here and there. 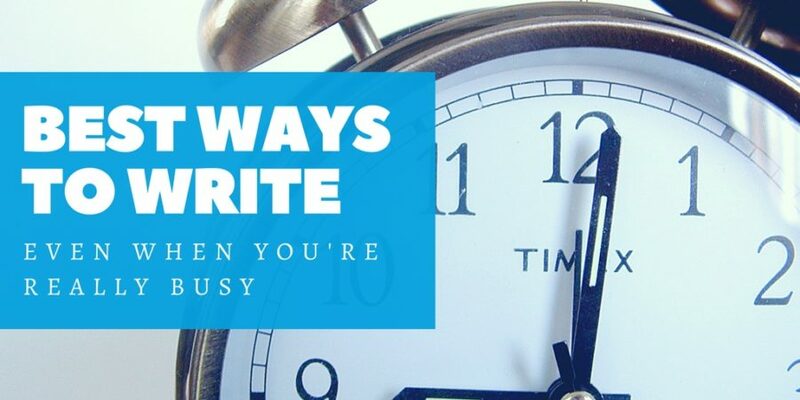 The bottom line is this: extreme cases aside, you’ll always have time to write if you make the time. I remember my senior year of college. I was taking extra credits, I had an on-campus job and friends to perform shenanigans with, and I still made time to write. Sorry if this sounds harsh, but I have a hard time believing people who frequently say I don’t have time to write. You do. It might take a bit of schedule reevaluation and priority sorting, but you do. And when you REALLY don’t (because those days do happen from time to time), remember: everything’s fine. Don’t sweat it. Oh, and if you keep a pencil in your pocket, point the sharp end up. Trust me. So what are some of your strategies to make time to write? Have you ever sat on a sharpened pencil and yelled so loud your classmate almost inhaled his syllabus? Talk to me down below!